Instant Pot Chicken Zoodle Soup | Easy & Tasty Instant Pot Soup Recipe! 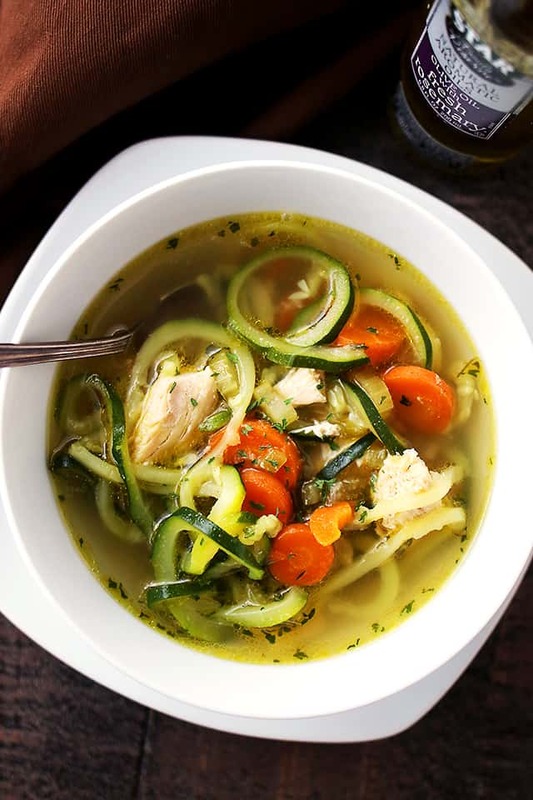 You only need 20 minutes to make this easy Chicken Zoodle soup in your Instant Pot! Healthy, filling and so delicious. A perfect keto friendly lunch or dinner idea. I DID IT! I used my pressure cooker and didn’t burn down da hauz! HELLO, friends! Hope you’re having a wonderful Sunday! I just got back from Punta Cana last night and can hardly keep my eyes open, however, this soup is something I have to share before I head back to the couch and feed my news-obsessed self with all this politics. But for now, let’s work on our dinner. Dinner that can now be in our lives for forever and always because, it’s easy, it’s super fast, and it’s SO goooood! Remember couple of weeks back when I shared about my Crock Pot Garlic Lime Chicken instant-pot-story? Guys, I can still see some spots that I missed on the ceiling… ugh. BUT mistakes are lessons in disguise, and trust me, lesson.learned. I read the manual from front to back, and back to front, and in the end, there’s really nothing to it. Patience is a virtue, one that I must start to practice. Anywho. Read the manual, friends. All the needed extra flavors are packed inside this bottle. 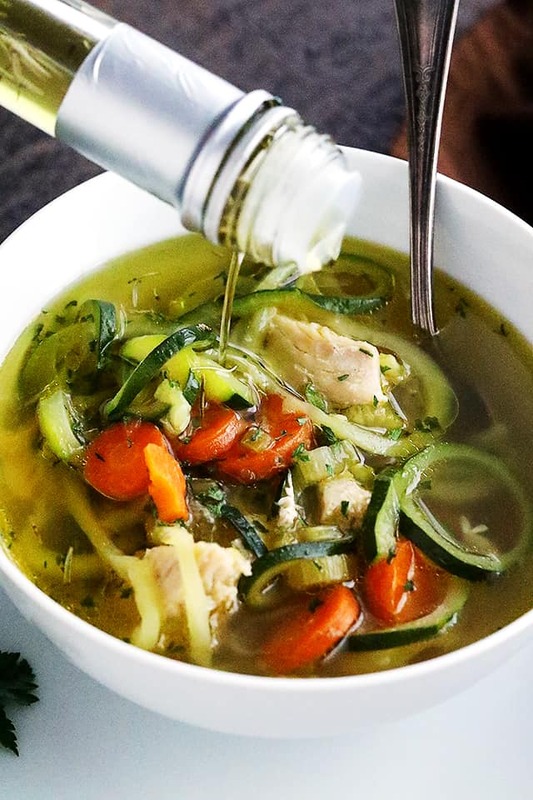 The aroma and fresh flavor of rosemary is the ultimate addition to our Chicken Zoodle Soup. We’re going to sautee all our veggies in it, but we’re also going to add a hint of it at the end as the ideal garnish. 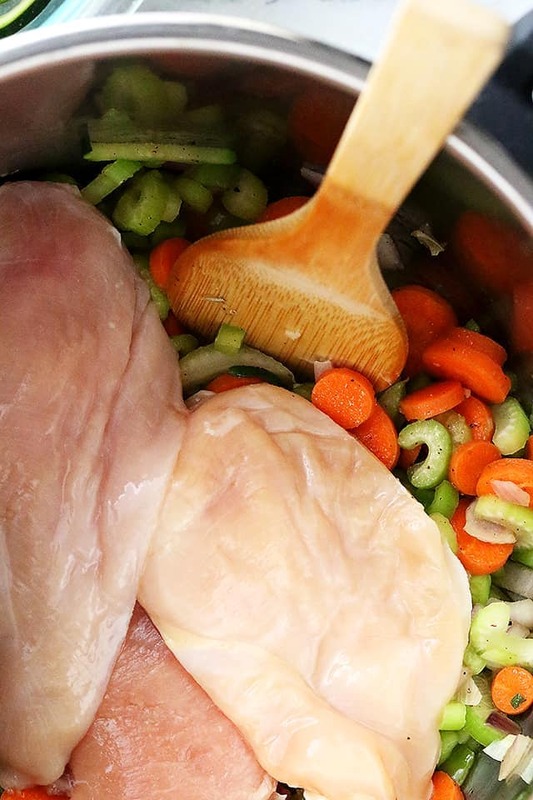 After a few minutes of sautee, we’re going to add a layer of chicken breasts on top + chicken broth, and let all that cook up together for about 15-ish minutes. That includes the time that the instant pot/pressure cooker needs to reach pressure. And then?!? 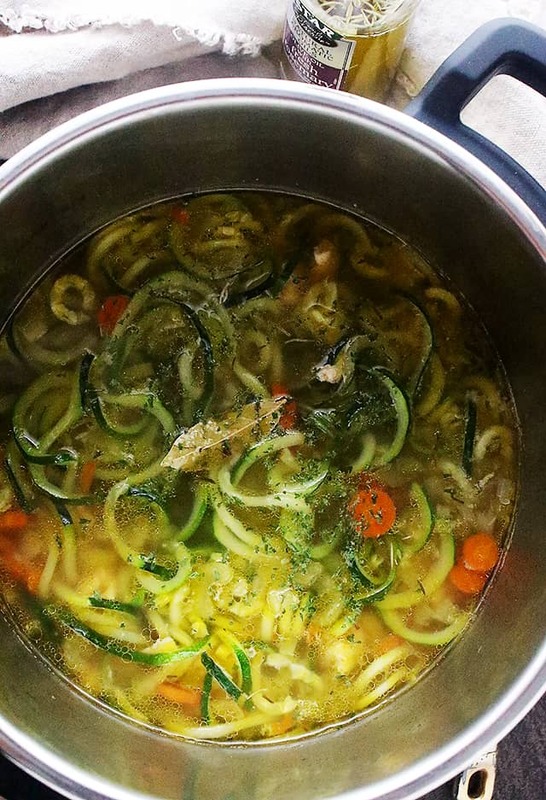 Chicken Zoodle Soup madness in just minutes! Handfuls of spiralized zucchini will be added at the end for just a few minutes, or until al dente. 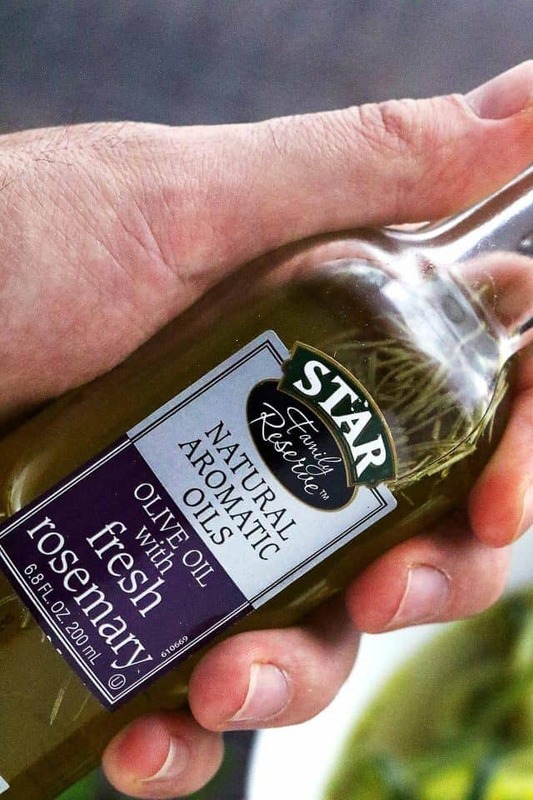 Drizzle STAR Olive Oil with Fresh Rosemary over the soup and SERVE! Sort of like rocket science, but way easier. 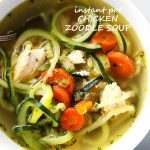 You only need 20 min to make this easy Chicken Zoodle soup in your Instant Pot! Healthy, filling & delicious. A perfect keto friendly lunch or dinner idea! Pour 1 tablespoon of the olive oil inside the pot of your pressure cooker and heat it over medium-high heat. 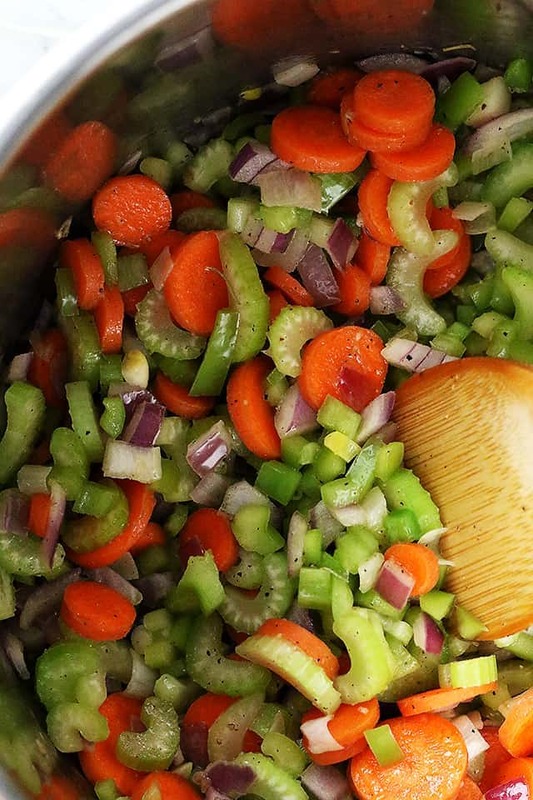 Add onions, carrots, celery, peppers, and garlic; season with salt and pepper and sautee for 4 to 5 minutes, or until veggies are tender. Add bay leaf and layer the chicken breasts over the vegetables. Stir in chicken broth and apple cider vinegar. Cover pressure cooker with the lid and lock it. Check the owner’s manual or recipe booklet to see exactly what the pressure-cooker manufacturer recommends. *Start cooking over high heat until you reach pressure, about 6 minutes. Reduce heat and cook at a constant pressure for 9 minutes. Release the pressure; once venting is complete, remove the lid and take out the chicken; transfer chicken to a cutting board and shred it. Add chicken back into the pot and stir in spiralized zucchini. Cook over medium-high heat for about 4 minutes, or until zoodles are cooked to a desired texture. Drizzle with STAR Olive Oil with Fresh Rosemary and serve. 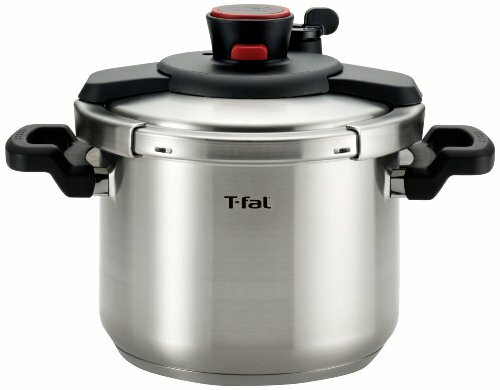 *I use a stovetop pressure cooker; in automatic electric pressure cookers, there is a count-down feature that automatically maintains the pressure for a certain time. I’m confused. You exclaim that this is an Instant Pot recipe, but then you have an asterisk to explain that you use a stovetop pressure cooker. That begs the question: is the 9 minutes for an electric pressure cooker, or for a stovetop pressure cooker? This sounds/looks great. 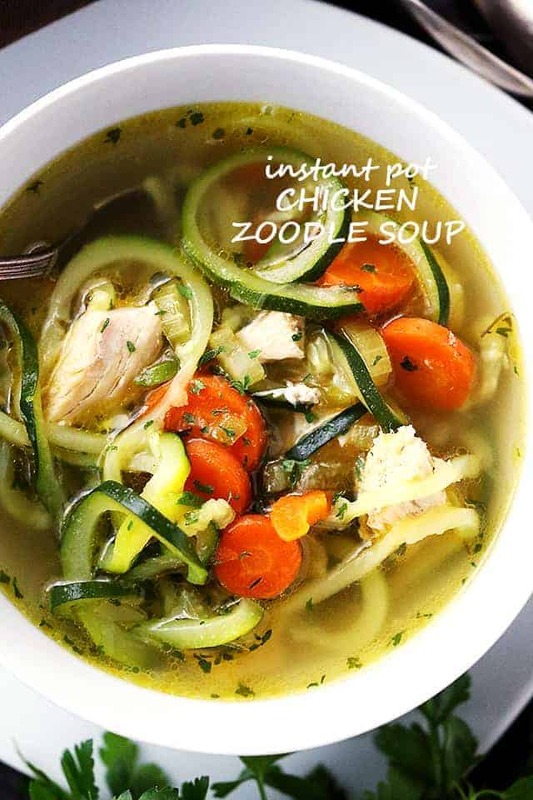 I have an InstaPot and I think I will try adding the zoodles when I pull the chicken out to shred and then close the back up quickly and let them just cook in the hot broth. It’s usually plenty hot for a while, especially if I lock the top back on, after the pressure is released and I think probably hot enough to cook the zoodles just right. I’m curious about the addition of ACV in this recipe though. I use it when making my own chicken broth or bone broth in from chicken bones because it helps break down and extract the minerals from the bones but we aren’t doing that here and as soon as you heat it that much you loose the benefits of raw ACV or the “mother” so what is the purpose of the ACV in this recipe? This recipe is so good! I just made it and it is the best chicken noodle soup I have ever made. The only changes I made are I used boneless skinless chicken thighs and medium hot green chilies because that’s what I had on hand. I also made Rosemary olive oil because the website was sold out. The olive oil added an amazing flavor. This would be good… but I wish I hadn’t added the cider vinegar. I can taste it in the soup. Bah. How long would you cook this in an Instant Pot? 9 minutes, or less? I am planning on just stirring in the zoodles once the soup is done and letting them “soak” until they are soft….?? After removing the chicken to shred, I put the lid back on for 1 minute on manual pressure cook and did a quick release. Perfect! When i print the recipes it prints without the picture. Is that the way it’s supposed to print. Hi! Yes, it’s set up that way so that it doesn’t waste your ink. I am terrified of pressure cookers. My Grandma had one explode in her kitchen and turned her oven hood inside out. My sister in law had one blow up in her kitchen also and her 2-year-old ended up with 2nd-degree burns. They just scare me. Maybe I can plug it in outside. Could you use a slow cooker ? If so, how would you do it? I seriously need to get on the ball of trying zoodles. I’ve heard they’re awesome. They are amazing sautéed with some olive oil and fennel seed. They need to look translucent to be cooked, and it takes longer than you think. Good with spaghetti sauce and sausage. I wish I had a big bowl of this soup right now! 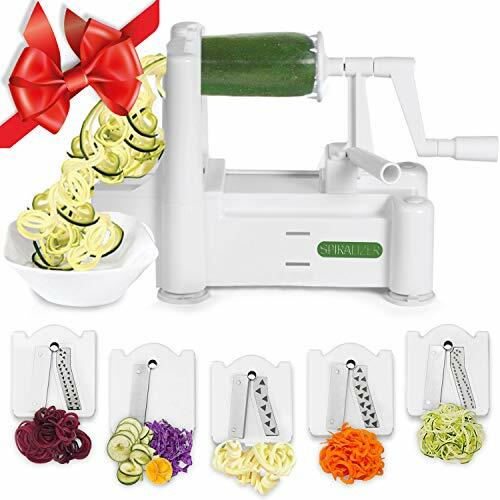 Loving the zoodles! What a great meal to have during the week that’s so healthy and packed with flavor! This is a definite win! I love that this is quick, easy and low carb — exactly what I need! I’ve been hearing such great things about instant pots! This meal looks amazing, and I might just have to invest in an instant pot myself! Great recipe! I want a bowl now! Oh, I love a good chicken soup. I must get to the store soon so I can make it, thank you for the recipe! I hadn’t thought of putting zucchini noodles in soup before…I can’t really imagine why now, it sounds divine.